Remember how annoying winding up a cassette with your finger used to be? I thought we were past all of that nonsense, but the designers behind the NVDRS MP3 cassette tape have other plans. 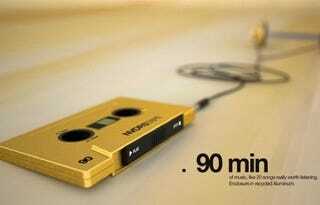 In fact, they are taking the cassette concept to such extremes as to render the digital benefits nearly pointless. The disks would come in 45/60/90 minute capacities (like actual retro cassettes) and require the user to manually rotate the spools with a finger or pencil to select songs. Rotating the second spool charges the kinetic battery.